Acoustilay 8 offers the same resilient base as the 15 range, but bonded to one layer, providing a total thickness of 12mm. It offers the same capacity to deal with impact noise as 15, but insulation against airborne noise depends on the existing structure. 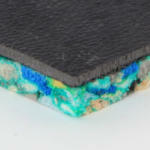 Acoustilay 8 is supplied in 1200mm x 1200mm pieces which may either be loose laid or bonded to the floor. It can be fitted tight up to the perimeters without the need for an isolating strip. Acoustilay will not transmit vibrations into the walls. Sheets should be laid in a brick pattern, with staggered joints, and butted tight together. The Acoustilay range of acoustic insulation products remains incredibly popular with specifiers and end users, as well as those simply seeking to reduce impact of noise on their own property. The range is versatile, environmentally friendly and easy-to-install. The range has been developed to minimise its impact on the environment. Acoustilay is manufactured entirely in the UK, cutting down on the carbon footprint usually associated with imported goods. The material used for the barrier mat is manufactured using pre, mixed and post-industrial waste sources, and the PVC-free material has a structure that makes it one of the least polluting plastics on the market. It also means that the material doesn’t emit any toxic compounds when burned. Of course, acoustic performance is still a priority. That’s why the Acoustilay range continues to be popular, offering excellent noise reduction properties across the board.